WataugaWatch: What Did McCrory Know, and When Did He Know It? 1. All the way back in 1994, while working for Duke Energy and serving as a Charlotte city council member and mayor pro tem, McCrory chaired a council meeting and voted on a matter that benefited his employer's bottom line, sparking a case that went to the state Supreme Court. The state's supremes allowed the council's decision to stand though a dissenting opinion from a Republican justice raised concerns about McCrory's conflict of interest. 2. In 1997, McCrory, by then serving as Charlotte's mayor while still working for Duke Energy, went to Washington, D.C., to testify as mayor against federal clean air regulations for the city that would have cost his employer an estimated $600 million to clean up its pollution. 3. Last year, Pat McCrory reported owning Duke Energy stock with a minimum value of $10,000, though he refused to say exactly how much stock he owned and how much it is worth. 4. Employees, former employees, spouses, and political action committees of Duke Energy and its Progress Energy subsidiary gave McCrory's two gubernatorial campaigns over $300,000 in direct contributions in 2008 and 2012. 5. On January 4, 2013, just minutes into actually holding office as governor, McCrory received a letter from several environmental and consumer groups asking him to recuse himself from appointing new members to the NC Utilities Commission because of his ties to Duke Energy. McCrory ignored the request. 6. After McCrory took office in January 2013 and his appointees took over management of the NC Department of Environment and Natural Resources (DENR), environmental groups tried to use the federal Clean Water Act's citizen lawsuit provision to force Duke Energy to clean up its coal ash pits because DENR was doing nothing to enforce Clean Water ... only to have their efforts blocked by DENR, which essentially declared that it was in charge of enforcing the Clean Water Act. 8. February 2, 2014, the Sunday that coal ash was discovered leaking into the Dan River from one of Duke Energy's coal ash pits at Eden. More than 24 hours later, Duke Energy admitted that tens of millions of gallons of toxic coal ash waste were continuing to spill into the river. At about the same time on that Monday, DENR dispatched regulators to the site. The public at large did not become aware of the toxic spill until Tuesday, February 4. 9. Both Duke Energy and DENR's head John Skvarla declare that drinking Dan River water that's treated by a municipal water treatment plant is perfectly safe. The ash pond is still spewing pollution into the river Tuesday afternoon, February 4. 10. On Thursday, February 6, Governor McCrory, with DENR head John Skvarla in tow, made a show of visiting the spill site and said publicly that this needed to be cleaned up. He made a point of bragging about the $99,000 fine his administration had recommended against Duke Energy for its leaking ash ponds. At the same time that Gov. McCrory was visiting the site, both DENR and Duke Energy were issuing data purporting to prove that the water in the river was not toxic to humans or fish. Plus the spill was not yet fully contained, though it had been slowed to what constituted "a dribble," compared to Sunday's deluge. 11. Monday, February 10, DENR asked a judge to put the settlement with Duke Energy (referenced by # 7 above) on hold, including the $99,000 fine … possibly because DENR had been informed by federal authorities that a criminal investigation was being opened and subpoenas of DENR officials would be forthcoming. 12. Wednesday, February 12, DENR warns citizens not to drink, or even touch, water in the Dan River. 13. Thursday, February 13, news broke that the U.S. Justice Department had launched a criminal investigation into the Dan River spill and that subpoenas had been issued to both Duke Energy and DENR, summoning them to produce records before a federal grand jury scheduled to meet in Raleigh March 18-20. 14. On Friday, February 14, McCrory held a press conference on the state's response to the big snow storm, and he became visibly shaken when reporters asked about his relationship with Duke Energy, and then irritated when reporters pressed him on the issue. He looked guilty. 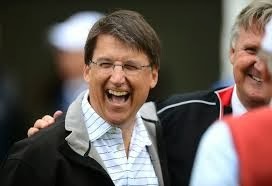 No fair being mean to poor Governor McCrory! He's just a lackey for Art Pope. And it's hard out there for a pimp, or so I have heard.